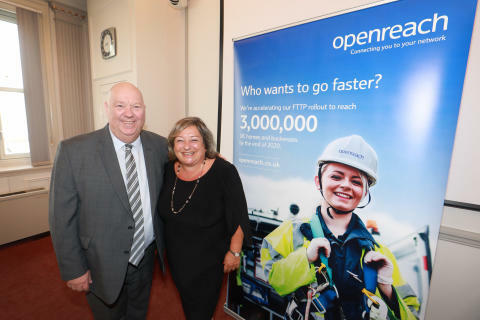 Work to roll-out ultrafast broadband* in Liverpool is well underway – with tens of thousands of homes and businesses in the final stages of being connected - Openreach’s managing director, Kim Mears, announced during a visit to the city today (Friday 20 July 2018). The update was given during a breakfast meeting with Liverpool Mayor Joe Anderson, who was joined by business and civic leaders, academics and representatives of other key organisations. The build is part of Openreach’s plans to make new, more reliable, and more resilient Fibre-to-the-Premises technology available to three million homes and businesses across the UK by the end of 2020. The technology provides additional capacity for data-hungry services and applications, such as Virtual Reality gaming and smart homes, where a network of online sensors can coordinate and control home appliances – from thermostats, door bells and security cameras to door locks, lawn sprinklers, window blinds and washing machines. And for businesses, it further improves their ability to improve the way they work, explore global markets through the use of new technology, backup systems and processes, as well as operate more efficiently thanks to much faster upload and download speeds. It also adds even more reliability and resilience to the network, meaning things are less likely to go wrong in the event of unforeseen circumstances or extreme weather and conditions. “Liverpool already has a thriving digital economy with widespread access to high-speed broadband – with more than 97 per cent of premises already able to access superfast speeds. “I’m delighted that Liverpool has been selected as one of the first UK cities to benefit from Openreach’s ‘Fibre First’ programme. “A world-class city deserves world-class digital infrastructure, and we believe full-fibre technology will be key to unlocking the long-term productivity of businesses in this region. It’s a further boost for Liverpool, following the announcement earlier this year that Openreach were looking to recruit more than 280 new trainee engineers across the North West to help deliver ultrafast broadband. Nine cities across the UK - Bristol, Birmingham, Cardiff, Edinburgh, Exeter, Leeds, Liverpool, London and Manchester – make up the first phase of Openreach’s ‘Fibre First’ programme which will connect up to 40 UK towns, cities and boroughs with FTTP networks. Since starting its ‘Fibre First’ build programme just a few months ago, Openreach is in the final stages of completing the FTTP infrastructure to nearly 100,000 premises across nine locations in the first phase of the programme. This is part of a wider rollout of the technology that’s already reached more than 600,000 premises – more than half in rural areas. * Ofcom defines superfast broadband as offering speeds of 30Mbit/s or more, and ultrafast of 300Mbit/s or more.